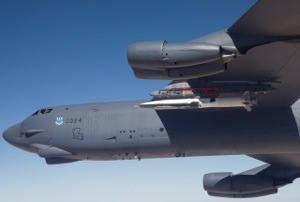 The U.S. Air Force has released new details of the record-breaking hypersonic test flight conducted by the Boeing-built X-51A Waverider demonstrator on May 1. The diminutive scramjet-powered vehicle achieved a blistering Mach 5.1, covering 230 naut. miles in just over six minutes (240 seconds!) over the Point Mugu Naval Air Warfare Center Sea Range in the Pacific. This technology could be the next breakthrough for space booster technology…next as in ten to twenty years. In the meantime it could fuel a new arms race in rapid strike weapons. This is not a US first move, the Russians, Australians, the Europeans, maybe even the Chinese have been leading in this speed regime up to this point. This entry was posted in Aviation, Future, Space, Technology and tagged DARPA, hypersonic, scramjet, x-plane by Sci Fi Engineer. Bookmark the permalink.